I began interviewing my father in 1967. Is this the way to talk to a parent? If interviewing is “listening with love,” I have been listening with love for four decades. Of course, I was listening even before I began interviewing. As a child I listened to detailed explanations of everything from combustion engines to where babies come from. “The womb is a pear-shaped object,” my father would begin. “Do you know how a car works?” he would ask. “What about the stock market?” And so it would go, especially during the drive from his paint and wallpaper store in downtown Toronto to our home in the suburbs. I still listen to my father’s explanations. While driving across the Brooklyn Bridge during a recent visit to New York, he launched into an excursus on the engineering of suspension bridges. Something happened in 1967, however, that was to change the course of our conversations forever. That November, during the Thanksgiving break, I came home with Y. M. Sokolov’s Russian Folklore, which I was reading for a course. Sitting at the kitchen table, I read aloud from the chapter on funeral ceremonies: “In order to protect themselves from the return of the dead man, they would lay him out on a table or bench . . . invariably with his feet toward the outer door. . . . In the window, water was placed in some kind of vessel, and a towel was hung up, so that the soul of the dead man might wipe itself.” “Jews did that too,” my parents remarked. Thus began the interviews that I was to conduct, with both my parents, for the rest of our lives. 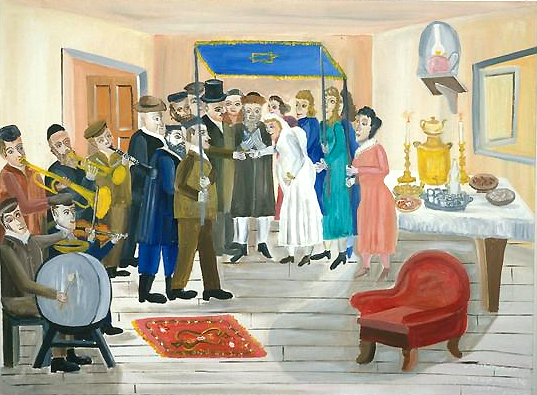 They Called Me Mayer July: Painted Memories of a Jewish Childhood in Poland Before the Holocaust arises from a forty-year conversation between a father and a daughter. When I began interviewing my father in 1967, it was with the intention of both salvaging what he could remember of his life Poland and documenting his immigrant experiences. He was born in Opatów (Apt) in 1916 and came to Canada in 1934. Over the years, as I continued to interview him, it occurred to me that someone whose memory was so visual should be painting what he remembered: whenever he would explain how to bridle a horse or how to make a shoe, he would make a quick sketch to show me what he meant. Finally, in 1990, after a decade of coaxing, he began to paint at the age of seventy-three. With the paintings in hand, the interviewing intensified and the idea for a book that would integrate images and words emerged. But what kind of book would it be? As I began to compile the manuscript from the transcribed interviews and Mayer’s pithy writings, I decided that the text for They Called Me Mayer July would be entirely in Mayer’s voice and that its structure would arise from an internal logic, yet to be discovered, in the tangled network of stories and images that he had created. When I say that They Called Me Mayer July is entirely in Mayer’s voice, I mean to distinguish this book from such works as Art Spiegelman’s rightly celebrated Maus, which is structured around “the story of the story,” that is, around the process of creating the work. Maus shows both parties to the collaboration in conversation, overtly representing their relationship and way of working together. Indeed, for Spiegelman “the story of the story” is the story. This is decidedly not the case in They Called Me Mayer July: here, the story is the story. Nonetheless, to say that They Called Me Mayer July is “entirely in Mayer’s voice” is not the whole story because the text is anything but a monologue. Quite the contrary, it is profoundly dialogic, but without our forty-year conversation appearing as such in the text. In They Called Me Mayer July the voice of the text is the voice of our collaboration. There were many other ways we could have composed this text. I could have told Mayer’s story in the third person. I could have written in my first-person voice and quoted him. I could have preserved the form of the interview. Or, in the manner of Charlotte Salomon, we could have matched a sequence of images to a sequence of discrete texts. We chose instead what anthropologist Barbara Myerhoff calls the “third voice,” which she explains as follows: something new, a “third person,” is created “when two points of view are engaged in examining one life.” That voice can be heard in the text’s orientation to the listener: “the authorial word enters the other’s utterance from the lived subject position of the listener, that is, as if it were a gift of loving attention,” as Mark Kaminsky explains in his account of Myerhoff’s approach. For Myerhoff, who developed these ideas while working on Number Our Days, a book and film about elderly Jews living in Venice, California, listening is an ethical stance; it is essential to what she calls “growing a soul.” The third voice that emerges from the listening relationship is realized textually through an approach to editing that she calls “soulwork.” To be present in the text as a listener is not an act of self-effacement, but one of intense attentiveness. What resulted is more picaresque than bildungsroman. They Called Me Mayer July is episodic: It is made up of spare anecdotes told in the 'realm of living speech,' digressions into the practical workings of the world. ... This is Walter Benjamin's art of the storyteller, "the man who could let the wick of his life be consumed completely by the gentle flame of his story." “It is perhaps in the artisan that one must seek the most admirable evidences of the sagacity, the patience, and the resources of the mind,” writes Jean Le Rond d'Alembert in his “Preliminary Discourse to the Encyclopedia of Diderot.” This too was Mayer’s philosophy. 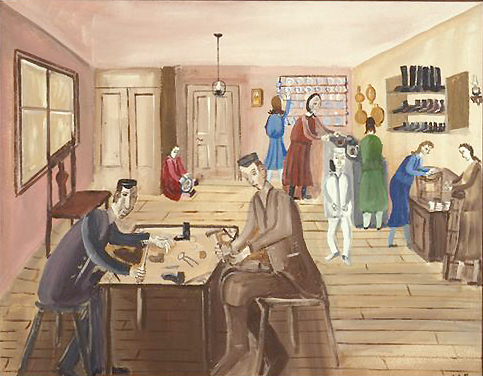 With the town as his classroom, Mayer pursued a self-designed curriculum of gestural knowledge, embodied intelligence, and know-how connected to tools, materials, processes, and workspaces: the cooper, ropemaker, blacksmith, butcher, goldsmith, carpenter, brushmaker, tailor, and shoemaker. Delight in how things work--“the pleasure taken in observing processes”--is what Neil Harris calls the operational aesthetic. Mayer says he has no imagination, by which he means that he is more interested in the “made” than in the “made up.” Mayer’s disclaimer notwithstanding, memory and imagination go together. His capacity to find the extraordinary in the ordinary is the form that his imagination takes. We might call this kind of imagination extrospective because it is more concerned with the palpable world than with interiority. In this respect, They Called Me Mayer July is an instance of what Paul John Eakin calls the referential aesthetic. What makes Mayer’s stories memorable is precisely that they do not force “the psychological connection of the events” on the reader (or the listener); this is a hallmark of the art of the storyteller as Walter Benjamin understands it. When Mayer says, “What I am trying to do basically is not to glorify myself, but to portray life as it was,” he points to what makes They Called Me Mayer July an extrospective autobiography. It is a prime example of the “dependence of the self for wholeness on its surroundings,” in John Dewey’s words. Mayer’s account differs from the autobiographies that the YIVO Institute for Jewish Research had hoped to solicit from Jewish youth in Poland during the 1930s through a series of autobiography contests. What YIVO wanted were autobiographies that would yield insights of psychoanalytic value, the better to understand a generation that in many cases saw little hope for a future in Poland. The more introspective, the better. Mayer could easily have been a contestant; he was in Poland at the time and the right age to enter the contest. But would he have won a prize? What kind of autobiography is They Called Me Mayer July? And, is They Called Me Mayer July an autobiography, strictly speaking? If, as Elizabeth Bruss states, “There is no intrinsically autobiographical form,” what kind of autobiography is They Called Me Mayer July, particularly when Mayer asserts, as he often does, that his project is about Apt, not about himself, and that all such towns were pretty much the same? This kind of autobiography, which gives precedence to the world in which Mayer lived, is what I am calling extrospective; others have called it autoethnographic, because of its strong documentary impulse and focus on daily life. Although many examples of this kind of autobiography can be cited, to mention only those of Henry Louis Gates, Jr. and Zora Neale Hurston, Jewish autobiography has been characterized not only as a late flowering within the history of autobiography more generally but also as decidedly not in the confessional mold of St. Augustine and Rousseau, whose accounts have traditionally defined the genre. 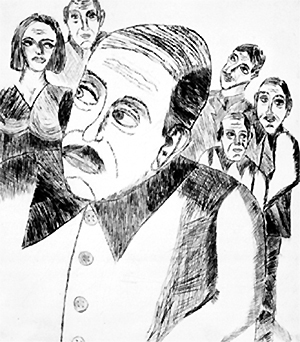 It follows, some have argued, that most Jewish autobiographies are therefore not autobiographical because their focus is “not upon the self of the author but upon the community, the first-person singular of the autobiographical narrator being, in effect, a trope for the first-person plural of the collective,” as Marcus Moseley discusses in his magisterial history of Jewish autobiography. Given that all autobiographies are relational and that they can take any form, They Called Me Mayer July may not look like Rousseau’s Confessions, but that does not make it any less autobiographical. In a letter dated June 6, 1982, Mayer wrote to tell me that he had carefully packed the porcupine he made from an intact eggshell and toothpicks, and that he hoped this time it would arrive in one piece. He included a few Yiddish children’s rhymes in the letter and a P.S. : “This should make your day a happy day for you.” Indeed, it did. They Called Me Mayer July is the culmination of many such happy days. Excerpt from "A Daughter's Afterword," They Called Me Mayer July: Painted Memories of a Jewish Childhood in Poland Before the Holocaust (University of California Press, 2007).